Meet the judges for the 2015 Wilson Center Guitar Competition and Festival. Mike DeRose hails from the Midwest city of Racine, Wisconsin. Born and raised there, he was drawn towards the guitar at an early age. Mike taught guitar for 20 years at a local music store, until recently when he decided to devote all of his time to recording and performing. He has played in numerous locales from New York to California, and he can recently be found performing for Hal Leonard instructional series. His many years of travel and playing have all contributed to his wide variety of styles and techniques. Mike prides himself on being able to play just about any genre of music that a recording artist may require, with his favorites being Jazz/Fusion, R & B, and Rock ‘n’ Roll. Stefano Barone is a composer, guitar player, producer, video artist, and music teacher from Italy. He is considered by the critics as one of the most creative and interesting contemporary acoustic guitarist composers of our time. Born in Naples (Italy, 1978), he started playing music when he was very young. He studied piano at first but picked up the guitar quickly and did not let go. 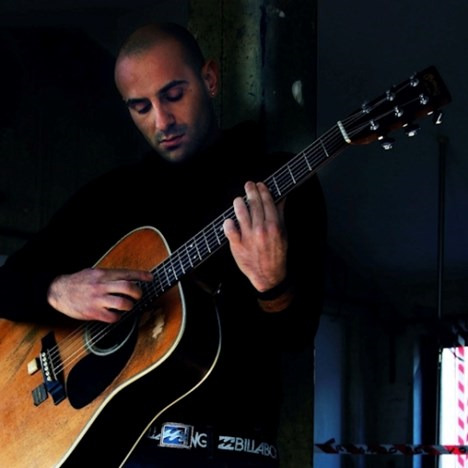 From blues to pop to rock, he went through different musical experiences until he moved to Rome in 2001 and decided to dedicate himself fully to solo acoustic guitar. When he first listened to Michael Hedges' striking album Aerial Boundaries in 2003, he began studying modern acoustic guitar techniques and composition with Pino Forastiere, Dominic Frasca, and Sergio Altamura. He also embraced contemporary music in general, in particular American minimalism composers such as Steve Reich and Philip Glass. Stefano has a masterful guitar technique and an extraordinary control of the electronic effects and devices used in many of his creations. He skillfully uses the devices and effects at his disposition creating great orchestration and harmony. His Neapolitan roots gave him the innate and infallible sense of rhythm and the natural ability to improvise. A perfect balance between acoustic and electronic, he performs live an uninterrupted program in which all the songs played are woven together in the most brilliant methods. With his debut album particolare#uno (Candyrat Records, 2009), Stefano Barone has immediately gained the attention of both of the critics and the public. His song, “Batman”/"Alexander Supertramp," has earned more than 2 million views on YouTube. The song, along with other compositions of his, has been featured on various documentaries, dance shows, and animation movies, and it has been picked as a testimonial song by the International Association “World Centers of Compassion for Children” founded by the Dalai Lama. Stefano is also a music teacher, director, and founder of the Istituto Massimo Guitar Orchestra (20 elements guitar ensemble) in Rome. He is composing the soundtrack for four documentaries that will be aired on the Italian National Television (RAI) and his music will be used on a new American TV series in 2014. He has performed in Italy, United States, Canada, Germany, Portugal, Panama, Turkey, Switzerland, and the UK. In 2014 he performed in Italy, UK, Tahiti, Australia/New Zeland, Caracas and Russia and with the Steve Reich's Ensemble 2x5. Andrew Lardner currently teaches private lessons and finger-style ensemble in the guitar department at the University of Wisconsin-Milwaukee. At UWM he has developed new courses utilizing his special skills in transcription, publishing, and digital marketing, such as the Finger-Style Guitar Ensemble and Contemporary Technological Skills for Performing Musicians. His primary focus is on 20th century American folk/blues, teaching new repertoire for finger-style guitar, and elevating bright young musicians to a high performance level, preparing them for a career in music. Rob Poland is the founder of Candyrat Records, an independent record label and music boutique. Candyrat was founded in 2004 after signing their first artist, Don Ross, a well-respected Canadian guitar player and composer. Five other artists —including Andy Mckee and Antoine Dufour—were signed before Candyrat officially opened for business in November of 2005. While instrumental guitar music is their core focus, Candyrat has released records in a number of different genres including electronic, singer-songwriter, alternative, and progressive rock. They currently represent more than 30 artists from ten different countries. Since the age of 18, Mr. Behr has been an active teacher and performer in the Milwaukee metropolitan area. He has been a faculty member of the Wisconsin Conservatory of Music since 2009. He earned his master’s degree in classical guitar at the University of Wisconsin-Milwaukee, studying with Professor Rene Izquierdo. In addition to teaching, Mr. Behr is a member of the Milwaukee Guitar Quartet and maintains an active performance schedule around Milwaukee and abroad. In 2008, Mr. Behr was asked by composer Carlos Rivera to record “Cancion,” his acclaimed solo work for classical guitar. In 2009, composer and guitarist Štepán Rak requested Mr. Behr to perform the American premiere of his new work titled Royal Suite. Mr. Behr was a recipient of the Dr. Shinichi Suzuki Scholar Award in 2010 and 2011. George Lindquist has been one of the foremost teachers of classical guitar in Wisconsin for more than 25 years. Teaching at the University of Wisconsin-Whitewater since 1995, he gives private instruction in classical guitar and directs the guitar ensemble and teaches a guitar class. Well known as a performer on both the guitar and the lute, he has been a member of several ensembles, including a classical guitar trio, a flute and guitar duo, and a guitar and harpsichord duo. He has performed at a variety of venues throughout Wisconsin and Illinois. He has also given many performances in the public schools sponsored by Young Audiences of Wisconsin. Mr. Lindquist received the M.M. from UW-Madison and a B.A. from Carthage College in both Music and Business Administration. He is one of the guitarists featured on the CD Milwaukee Guitar: Strictly Solo and can be heard on recordings with the Master Singers of Milwaukee and the Festival Choir of Madison. Anne Waller has performed as both a soloist and as a member of Waller and Maxwell Guitar Duo in concerts and festivals throughout the United States and Europe. She has also been heard on live broadcasts on radio and television as well as in master classes with Andrés Segovia, Oscar Ghiglia, and José Tomás. Other activities include conducting master classes at universities and festivals throughout the United States. Waller has studied with Robert Guthrie and Oscar Ghiglia. She is Senior Lecturer of Guitar at the Bienen School of Muisc at Northwestern University. A professional musician for 30 years, Don Linke is both a performer and educator. Linke has appeared in the pit at the Melody Top Theatre, Skylight Opera, Milwaukee Repertory Theatre, Florentine Opera, and the Riverside Theatre. He has appeared as an opening act for Freddy Hubbard, Stanley Turrentine, and Richard Elliot; and on stage with jazz luminaries Greg Abate, Frank Morgan, Melvin Rhyne, Richie Cole, and Brian Torfe. He has 10 recordings, including four critically acclaimed solo releases. He is the recipient of grants from the Wisconsin Arts Board and the United Performing Arts Fund. Linke began teaching at the Wisconsin Conservatory of Music in 1978 and has taught master classes and workshops throughout the country. His students are professional musicians around the world. Michael Standal has over 30 years of experience as a professional guitarist, composer, producer, publisher and educator. Michael studied jazz with pianist David Hazeltine at the Wisconsin Conservatory of Music and has taught privately and at a multitude of workshops including at the University of Wisconsin – Whitewater. Michael is a veteran composer and producer. He's composed, arranged, produced and played on pieces for domestic and international television, radio, music production libraries and major film releases. His compositions have been placed in over 1000 TV shows, feature films and major label releases worldwide. As a producer he’s collaborated with many extremely gifted artists including Clyde Stubblefield (James Brown), Matt Sorum (Guns And Roses, Velvet Revolver), Robben Ford, Joe Bonamassa, Paul Barerre, Roscoe Beck, Brannen Temple, Jon Cleary, Victor De Lorenzo (Violent Femmes), Greg Koch, Matt Walker (Filter, Smashing Pumpkins), Wesley "Sticks" McVicker (Eric Benet, Angie Stone) and John Ferraro (Boz Skaggs, Larry Carlton). Michael is a co-founder and CEO of MidCoast Music, which is represented worldwide by Warner/Chappell Production Music. When not composing and producing with his business partner, Chris Hanson, he can be found riding his bicycle, cooking or studying languages.